We decided to go all-electric for the van so we could avoid the hassles of a fixed propane tank. It’s working really well for us but we do still carry a small butane stove for extra capacity. 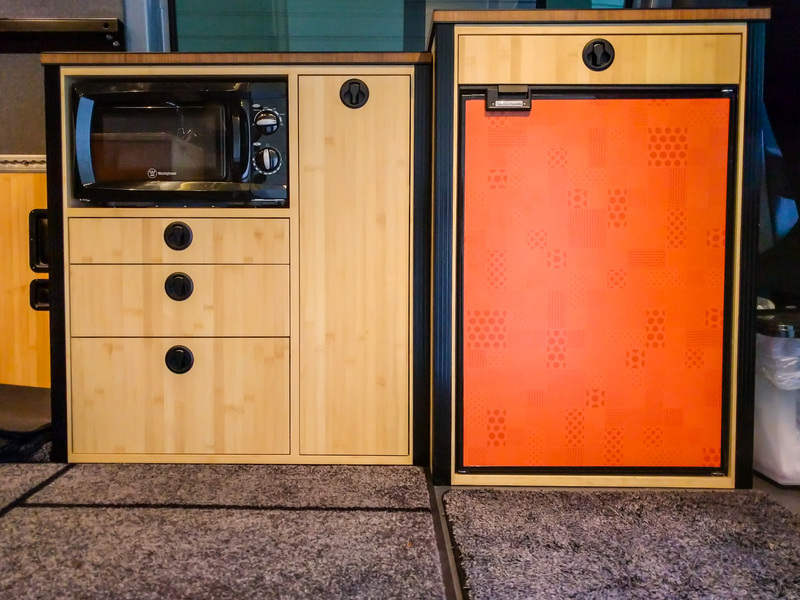 We aren’t trying to duplicate our full kitchen when we travel, but we do want to be civilized. There’s a balance between convenience and practicality for van life. We have a single-ring Duxtop induction cooktop for most of our cooking needs. We had to buy new Magma induction-ready saucepans because our existing travel set was not magnetic. Overall we’re very happy with both the induction ring itself and the Magma saucepan set. The pans nest into each other with removable handles, so they take up hardly any room. The non-stick coating makes washing up much easier, and the bases are heavy so there are no hot spots. The set even comes with some foam spacers to prevent the pans from rattling or getting scratched in transit. The induction cooktop is great for use inside the van, or when the weather is nice it’s easy to bring it outside. The folding table we bought is plenty strong enough for the cooktop and a full pan. It makes food prep much easier. We chose a Westinghouse WCM660B 600 Watt Counter Top microwave with mechanical dials. The smaller wattage consumption means we can use both the microwave and the induction cooktop at the same time with our 2kW inverter if neither of them are set to “high.” The mechanical dials mean that there is no microprocessor, and so no power draw when we are not using the microwave. That saves even more energy because it allows our inverter to enter low-power mode. Next to the microwave cabinet is the fridge. A Truckfridge 130. We’ve written about it already. It’s great for storing pretty much everything we need for life on the road. Much of our on-the-road cooking involves reheating things that we cooked earlier. Stews, pasta sauces, and such can be frozen beforehand. They save our battery by keeping the fridge cool while they defrost, and they are typically single-pot reheats. 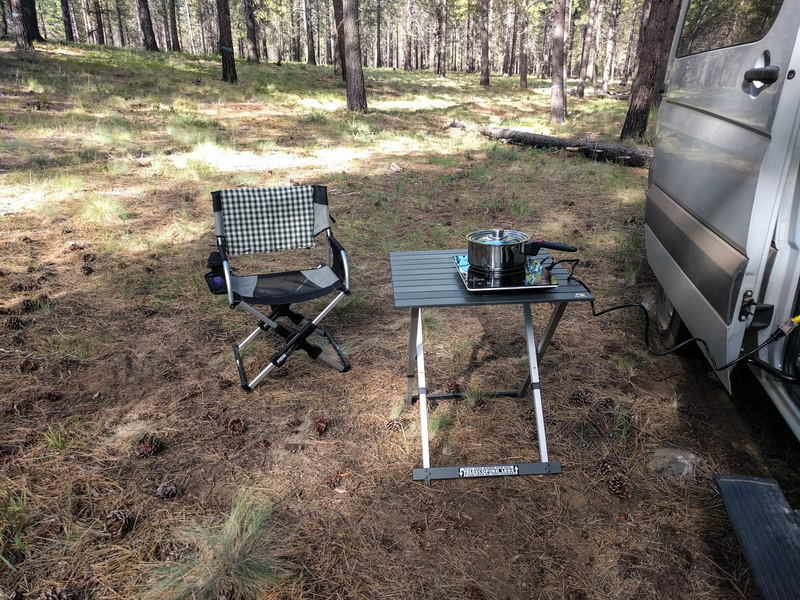 When we branch out into more adventurous cooking we can use the microwave as an additional cooking option, or our small butane camping stove. We both like a cup of tea in the morning, and the occasional fresh-brew coffee. We have a small Bodum electric kettle (similar to this one) that is just right for making two mugs’ worth of boiling water. We use an Aeropress for awesome tasting fresh coffee. The one thing that is hard to make while we’re traveling is toast. Cooking it in the frying pan is less than satisfying, but electric toasters are just too power-hungry to run from a battery and inverter system, and too bulky to store in the van for just occasional use. I checked out a salton induction cook top. However the controls beep at an almost ear piercing volume. (For the hearing impaired?). Just does not go with my camping aesthetic. Wondering if u have this concern with your model or if you have seen a model that makes nice quiet chirps or something? Ours has particularly loud beeps as well. Haven’t got round to trying to disable them yet. I don’t know of a quieter model. I have the duxtop now and its not nearly as noisy. Quite pleased with it – it came up with high ratings on other sites, and combined with your recommendation decided to get it. (thank you). I use it most of the time and supplement with a 1 lb propane bottle when doing a big cook up for more than 1 as my battery is not huge (448 aH). I probably don’t need the propane but being cautious as I get to know my battery capacities. Am trying to find the right size saucepan for boiling water for coffee. Currently using a good size pot which is a bit of a waste as the whole pot gets heated when I only need 16 oz of water. Just thought I would post this as my comments about induction cooker noise is not a problem with the duxtop. The beeps are not bad at all. Thanks Tim. The Duxtop is clever enough to sense whether a large or small pan is on top of it, so if you find a good small pan, it’ll only “heat” that smaller surface area in the middle of the ring. Milt, we’ve been looking at the instant pot too. So far though we haven’t bought one for home use or made room for one in the van. Looks like a good option though. Glad to hear it’s working for you. Like you say, the low amount of steam venting into the van is a real positive. I’m in the middle of designing a camper van and working on what components to use for the electrical system. I’d like to go with all electric, including an induction cooktop, but I’m concerned about power draw. I’m wondering if you ever have overload problems with your current setup while cooking. I haven’t been able to find detailed specs on the Duxtop, but I do have specs on the Summit SINC2B120, which is an 1800W dual burner model. Summit tells me that that unit has a power factor of 0.53, which means that while it draws 1800W real power, it will attempt to consume 1800 / 0.53 = 3400VA apparent power. Assuming the Duxtop has about the same power factor (since they’re both induction cooktops), that would imply that it would draw max 1300W real power but 2450VA apparent power. The Victron Multiplus Compact inverter supplies 2000VA apparent and 1600W real power. Have you ever experienced overload problems with your setup? Victron tells me the Multiplus Compact isn’t enough to run the Summit 1800W induction unit and that the Multiplus will fault out regularly if the induction unit is cranked to full blast. BTW, thanks for all the great site info. It’s been helpful. Hi, we’ve found that the Duxtop works fine with the Multiplus Compact even on full power. You seldom need full power for cooking anyway, and on the regular settings we use, the cooktop consumes less than 1000W. For all practical purposes the Duxtop works very well with our Victron unit. Obviously if you try to run other equipment at the same time – like a microwave or kettle – then you’ll start running into overload issues. When we’ve accidentally done that, the MultiPlus beeps and triggers an overload warning but typically if you turn the other device off fast enough the MultiPlus doesn’t cut out because it has good temporary surge capacity. I’ve not checked out the Summit model and I don’t claim to understand their power factor rating, but are you sure you can use that power factor rating in the way you are? I wonder whether it’s more a conversion from consumed Watts to actual energy output (i.e. how much efficiency is lost in the heating circuit). In the Duxtop’s case, that would be 1800W consumed, leading to just over 900W of heating power. Like I said, I really don’t know so I’m just guessing at numbers here but I can say that in real world usage we’ve not seen an energy draw higher than 1800W from the Duxtop, and it doesn’t cause the MultiPlus to alarm. Power factor is a ratio of real power to apparent power (https://en.wikipedia.org/wiki/Power_factor). Inductive loads have a low power factor because they, in essence, don’t just burn up all of the energy sent to it like a resistive load would. Resistive loads have a power factor of 1 (real = apparent). The Victron publishes both the real and apparent power specs for their inverter. Cooktop makers only publish real power (watts). Maybe Duxtop is better than Summit as far as power factor, or maybe the capacitance in the system compensates for the inductive load to some degree. Regardless, it’s good to know that the Duxtop works by itself. I prefer to use all-electric, but don’t want to have a giant inverter. i use the duxtop induction cooktop with a victron 1200 watt inverter. it will run at full power only for a minute or so, but if i throttle the cooktop to a reduced level, it will run continuously. it works fine throttled for frying bacon and eggs. Previous PostPrevious TruckFridge TF130 will take a whole pizza in its box!